This impressive program revisited two important commissioned works by Chinese-American composers: Bright Sheng’s spicy duet for marimba and violin, Hot Pepper (2010) and the monumental-ritual-theatrical work for vocalizing violist and chamber ensemble, In Other Words (2012), by Huang Ruo. Except for the Ruo (which calls for 10 players), all other pieces were duets and trios, with the evening’s heavy lifting shouldered by Richard Yongjae O’Neill (viola), Nicholas Daniels (oboe), Bridget Kibbey (harp), Paul Huang (violin), Ji Hye Jung (marimba/percussion), and Jose Franch-Ballester (clarinet). Supporting personnel on the Ruo included artistic director Adrian Spence (flute), Agnes Gottschewski (violin), Ani Aznavoorian (cello), and Timothy Eckert (double bass). It is a testament to just how persuasive and pedagogically effective Spence has been all these years, pressing the case for new music against aesthetically conservative audiences, that the 50-minute first half, devoid of diatonic certainties, was so attentively and enthusiastically received. Elliot Carter’s Trilogy (1992) for harp and oboe opened the concert. The 84 year-old’s harmonic language was so carefully developed, that the atonal complexity—masterfully handled by Daniels and Kibbey—seemed to almost make sense. The second half of the concert belonged to 24 year-old Taiwanese-American violinist Paul Huang, who dazzled the audience with his commanding tone and confident diction. Camille Saint-Saëns’s Fantasie for Violin and Harp in A Major, Op. 124 (1907), the only non-American composition on the program, stood out as a beautifully Romantic programming contrast. 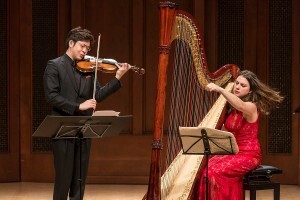 Late in the piece the harp lays down a repeating riff while the solo violin jams—Huang’s fluency and frenzy flowed like an improvisation. The violinist stepped into big Camerata shoes when he paired up with marimba player Jung for Hot Pepper—and played wonderfully. Finally, the evening concluded with Kevin Puts’s trio for clarinet, violin, and marimba, And Legions Will Rise (2001), which alternated Philip Glass-like ostinatos with serene atmospheric passages, leaving all of us certain the concert had transported us to distant worlds and back again.